Tony Wakeford of Sol Invictus, Death in June and Crisis fame, joins Gernot Musch (ex Pilori) for this new project; with their debut album of 11 tracks that plays right into the hands of what both artists do best. Neo-Folk is well worn and overused terminology nowadays, given that it is hardly ‘new’ at all; indeed most of the genre itself has become a little tired over the years due to oversaturation. 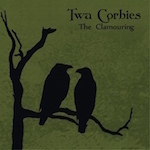 Luckily, with ‘The Clamouring’, this duo have injected a new lease of life into the scene, with bunch of songs that are engaging and involving; with a keen ear for harmony and well constructed lyrics that have all the essential hook-lines for you to latch onto. With particular interest to those that have followed Wakeford over the years, there are two songs on this release that should hold have them chomping at the bit. A reworking of Crisis’ first single ‘No Bosses’ (with the original lyrics that were eventually unused); and newly arranged ‘Laughing’. The former reeks of punk gusto and comes across with as much punch as the original, regardless of if its new acoustic format; and is a real highlight of the album. From start to finish, Wakeford and Musch have produced an album of real quality and steadfast musicianship. With real chorus’ you can sing along to and heartfelt sincerity, ‘The Clamouring’ epitomises the genre at its very best, minus the controversy and tiring idiocy that follows some of the artisans of this scene like a cloud of black vitriol; a quality album, from start to finish. This entry was posted in Bollebouz Tonträger, Tesco Distribution. Bookmark the permalink.